Over the past seven years, the Vermont Farm Fund has made over 1 million dollars in loans to Vermont farmers and food producers to help build the local agricultural economy. Last week the Farm Fund celebrated a million-dollar milestone after making a $30,000 loan to the Vermont Tortilla Company in Shelburne. 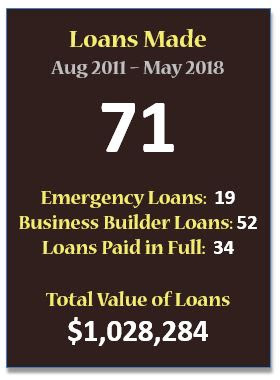 To date, the Fund has lent out $1,028,284 in 71 individual loans. The funding for these low-interest loans comes from individual donors and family foundations, and each tax-deductible gift supports a virtuous cycle, where payments from one generation of loans finances the next. Funds are lent to a farm, repaid, and loaned out again and again. So far in 2018 the Vermont Farm Fund has made twelve loans to a diverse group of farms and food producers from across the state. The funded projects included equipment for making value added products like wine, ice cream, apple cider and tortillas as well as farm infrastructure projects like hoop house heaters, sweet potato washing and packing, and fencing. Learn more here about the Vermont Tortilla Company, and the owner April and Azur Mouleart who are working with traditional methods and regional grain growers to make traditional tortillas. Or read about Ben Harris and the Harris Family Farm, which is the Farm Fund's first partnership farm with the VT Land Trust's Farmland Access program. Dairy farmers from New York state, Ben and his family will be moving to VT this year onto a long established organic wheat and vegetable farm, with the intent to expand the VLT farm, as well as service existing wholesale accounts for milled flour. This model - which is Community-Sourced financing, rather than Crowd-Sourced - is working well for Vermont. From the philanthropic donors and neighbors who support it, to the farmers and food entrepreneurs who pay it back, the cycle is regenerative. Visit the Vermont Farm Fund website, and make a donation to help keep this great work growing!